T-tops Red, white, or navy solid Long or short sleeved, necklines must be modest. No stomach or back showing when standing or sitting. Coats, Blazers or Jackets Red, Navy, White, or Khaki solid No Black and no sweatshirt type fabric. Skirts must be knee length or longer. Tiered skirts are okay, however no torn or frayed skirts. 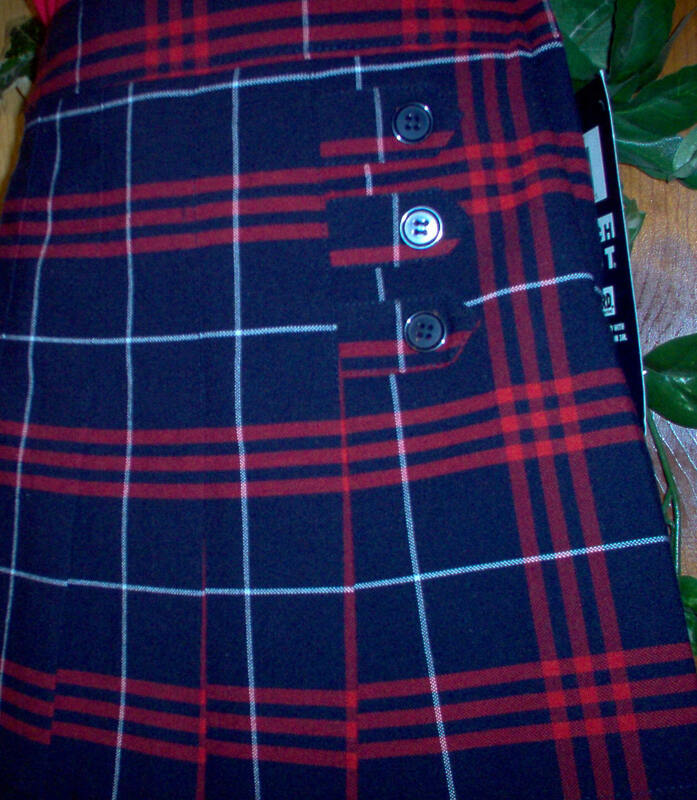 Skirts must be in solid school colors unless it is one of the uniform type plaid skirts *See samples of plaid skirts below. Skirts must have finished edges. Lace is okay, but torn edges will not be allowed. Socks Solid in school colors The rule of thumb is that you should match your socks to your pants, skirt or shoes. Shoes Brown, black or navy All shoes (including athletic shoes) must be dark with dark laces. No open toes. All shoes (including athletic shoes) must be laced neatly and tied. No stocking feet. Belts Brown, black or navy solid Belts may be leather or simulated. No studded belts. Jewelry Modest and not distracting All jewelry should be modest and non-distracting. If jewelry is large or gaudy, or attention drawing, it is not acceptable. Girls may wear ONE pair of earrings (pierced or clip-on) as long as they are modest and non-distracting. Colors should be in harmony with what you are wearing. No other piercing's are allowed. Pullover Sweaters Khaki, red or navy Long sleeved, may have one strip in school colors. Tie School colors + gold no cartoon characters or logos. Small amounts of green or brown is okay as long as it is conservative and not the base color of the tie. Socks Navy, black or khaki solid - White may be worn with light pants. The rule of thumb is that you should match your socks to your pants or shoes. *Remember, if in doubt, bring it to school (with the tags left on in case it is rejected) to be approved.